July 9: What's Jen Clicking on Between Newscasts? Puppies and babies. An advertiser's dream. Evian water's new campaign is taking advantage of the oldest trick in the book and some creative CGI to put together the most charming commercial I've seen in a long time. Let me just say, I'll write about something important eventually -- but this is hard to resist. It's only been up on YouTube for six days and already has almost 3 million page views. Any time I see Elita and Paul huddled around a computer giggling and grinning like dorks, with "Rapper's Delight" blaring from the speakers, and Jameela (our favorite Editorial Assistant, and I can say that as she manages our Today in LA Facebook page, rules the roost in Studio 10 and knows what we like at Starbuck's) looking conspiratorial, I know it's gotta be good. Let me qualify; I am not a fan of CGI babies in general (I hated the one on Ally McBeal, for instance, and really didn't like too much of the E-Trade campaign either) But I dare you not to smile when you watch this one. Of course I can't miss an opportunity to put up a cute picture of my dog Tommy when he was a puppy (you knew that was coming) as I look for more on the skating babies. Puppies AND babies, remember? 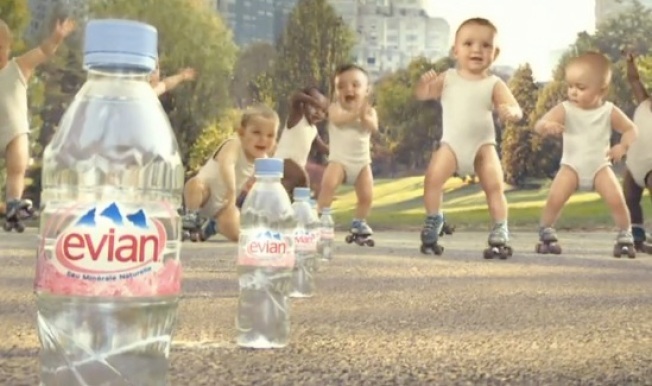 "Either way, the Evian roller babies commercial is a YouTube sensation. Already, millions of people have watched the video. In fact, in the past week alone, the video has been watched 3.8 million times on YouTube. The Evian babies were last screened 11 years ago performing an underwater ballet. Evian's worldwide director of brand Michael Aidan said that the firm was trying to sell drinkers a "dream". He said: "In the majority of countries in recent years, our communication has been very fact-based. "But consumers expect more from a big brand – emotion, dream. This is what we want to achieve – hence this breakaway and back to roots campaign." One female YouTube viewer said of the ad: "It's one of the cutest things I've ever seen". The ad was first shown on TV in France, Belgium and Canada over the weekend. An Evian spokesman said that no date has been set yet for showing the ad on TV in the UK. He said: "It's working so well virally that plans for TV in the UK are still under review." Why buy the spots when you're getting millions of views for free? If you think babies are irresistible, you'll understand why we had to say goodbye to our 6am producer Charmian this morning. She's a new mom, who doted on us here in the mornings for years before deciding to retire at the tender age of 30-something and spend all her mothering credits on her own little pipsqueak. We'll miss her like crazy ... and miss her blunt fashion sense (in my ear: "dude, you jacket's like ... biiiig." or, my favorite, after a newscast: "hey um, like, maybe you'll want to maybe like not EVER ever wear that again, kay? Love you, mean it!!"